Stroll into any old car rental business and you’ll wait in line, talk to an employee, fill out paperwork, and wait for the staff to pull the car around before you get the keys. 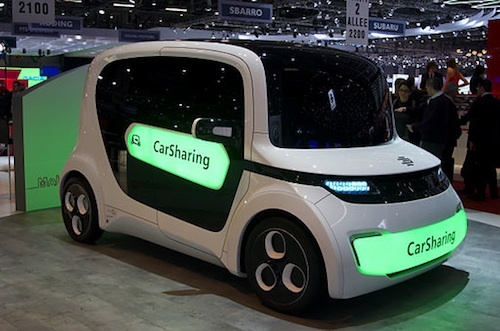 Though this model persisted for decades, an increasing demand for alternatives to car ownership has inspired a proliferation of models for car sharingthat are much more flexible and convenient. People turn away from traditional car ownership for various reasons, citing concerns about cost, environment, availability of parking, and more. BTR spoke to Susan Shaheen, Co-Director of the Transportation Sustainability Research Center (TSRC), about the growth of car sharing options. “By not having fixed costs associated with auto ownership in your transportation expenditures, [it] liberates an individual to take trips the way that fits their schedule and their choice the best,” she explains. 1. Round trip: The most familiar form of car sharing, with the most similarities to traditional car rental. Customers typically pay a company by the hour to use a car, with the cost of insurance, fuel, maintenance, etc., included in the price. Zipcar is a an example. 2. One-way: A customer may use a car without having to return it to its original location. One-way models typically charge by the minute and may employ designated parking spaces in a variety of locations or simply use whatever parking is publicly available. Zipcar hopes to soon offer this kind of service, but DriveNowcurrently offers it. 3. Peer-to-peer: Individuals contribute their personal cars to a fleet managed by a third party, which connects customers to vehicles. Essentially, it’s AirBnB for personal transportation. Some services enable access to the car using a smartphone app, no key required. Examples include Getaround and Relay Rides. 4. Fractional ownership: Several individuals become co-owners of a single car. Cars come equipped with technology to reserve times and manage the shared use of the vehicle. Audi is currently running a pilot program of this type in Sweden.